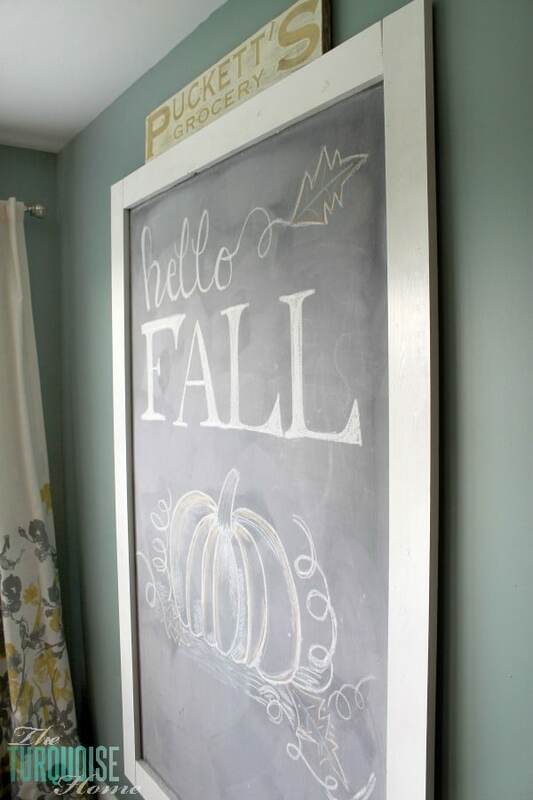 One aspect of my home that I love is my huge DIY chalkboard in my eat-in kitchen. I love that this wall holds one large decor item that I can easily change with every season or every whim. I’ll admit that I kept my spring chalkboard decor up until the first week of school when I changed it for Miss A’s first day of school picture. And then it was time to change it up for fall! I could go on. Have I mentioned how this is my favorite season of the year? Well, just love spring. And I think I change my mind every 6 months depending on whether it’s Spring or Fall. Haha! Check back with me in half a year, but today my favorite is Fall. 🙂 The reprieve from the hot summer (I live in Alabama, so it’s super hot and humid) gives way to the crisp, cool air, return to a routine, football season and all of it leading up to the holiday season. I just adore it every year! Every time I see a leaf fall to the ground, it’s one little hint that it’s coming. There was even a cool, dry breeze this evening (although the rest of the week is boasting highs in the 90’s. Ugh!). I can’t wait for the leaves to turn and to look out my back window at the vast array of color splashed all over the mountainside. 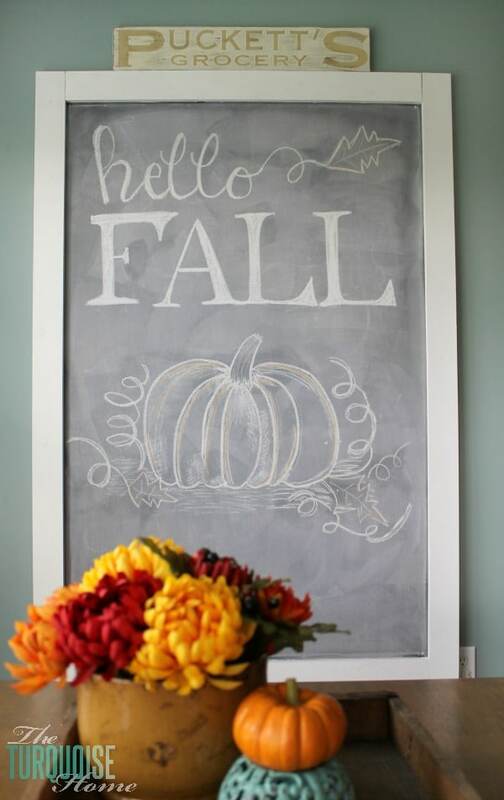 Are you decorating for the new season, or do you leave things the same year round? 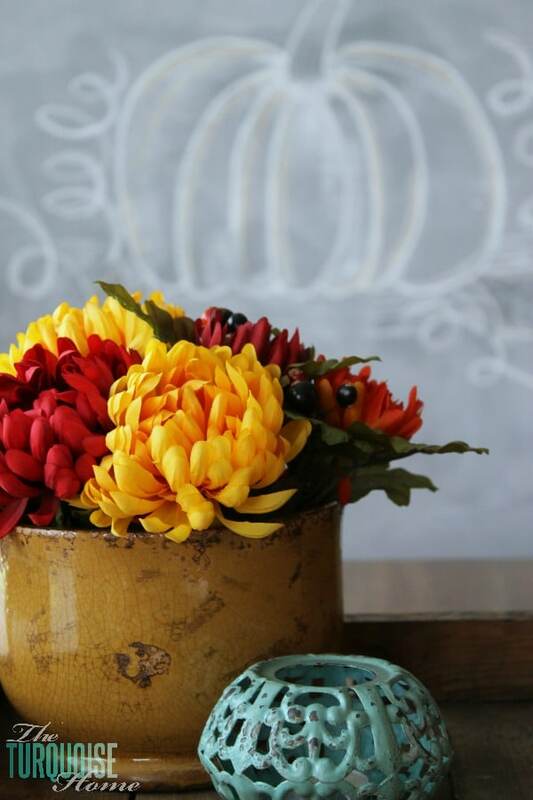 I love everything about Fall too….The beautiful, vibrant colors, football, cool, crisp weather, baking…there’s so much to love about Fall, especially in the South! Love your blog! So many awesome ideas! This is so pretty! thanks for linking up at DIY Inspired! This chalkboard is fantastic! I’d have one in every room of my house if I could. I’d love for you to share this at my weekly link party! http://www.thelifeofjenniferdawn.com/2014/09/a-little-bird-told-me-link-party-108.html Hope to see you there! Fall is by far my favorite season! 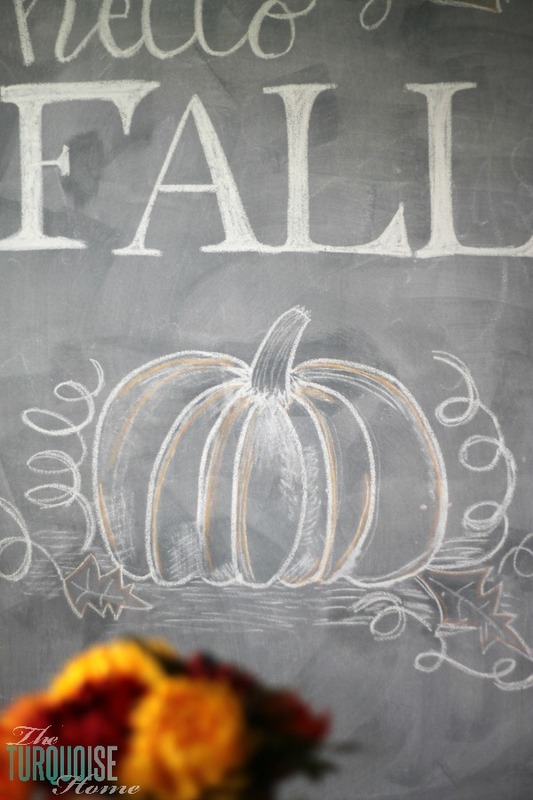 ….and I love the chalk board. Thanks for linking it up! Autumn is MY f a v o r i t e Season of the Year, also, dear one!!! For many of the same reasons you stated above. I love, LOVE, L O V E color!!! Reds, golds, sage greens all the vibriant hues of Autumn! A retired artist and interior designer. . .my home is now my canvas. I hold onto summer with the tightest of grips because I know we have months of grey ahead come winter…and September here is usually so beautiful…but now I am inspired. Thanks Laura! This is so cute Laura. 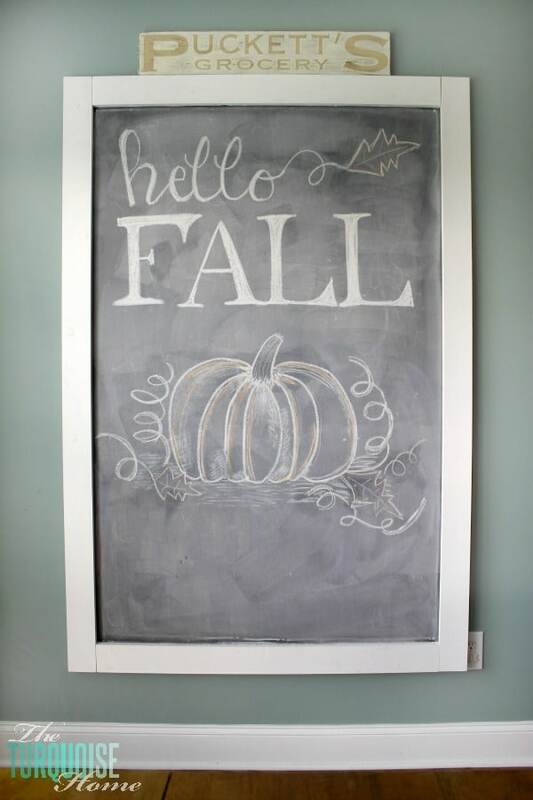 I need to perfect my chalkboard skills so I can do some fun stuff like this. I too get a bit excited at the first sign of fall, although it us usually in October here in So. California. I can’t wait! Hope you are having a great week! Love your fall design! I would love to have something like this in my kitchen. I love my chalkboard too. I made it out of an old door and it is the first thing I change when I start decorating.